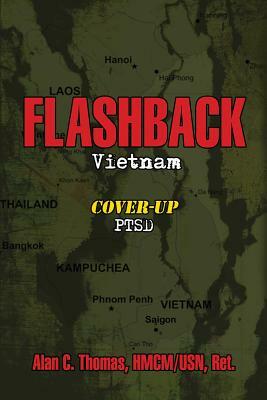 FLASHBACK: Vietnam: COVER-UP: PTSD is a reality-based memoir that is more than just a PTSD book. FLASHBACK is a true-to-life account of the conflict and the intense struggles experienced by the author after his return to "normal" life. Based on the real life experiences of author Alan C. Thomas. the book deals frankly and vividly with the struggles of forward-stationed soldiers suffering with PTSD, as a result of their military services. Through the main character Rob, readers live through all the phases of PTSD, including how it affects a family, what to expect from a spouse, and how it can change your life. Painted broadly with powerful, real world strokes from the author's personal experience, Flashback: Vietnam conveys what really happens while someone deals with PTSD. Get a first-hand glimpse into the trauma of the Vietnam War and the cost of war paid by the author and his fellow Hospital Corpsmen, Medics, Nurses, and Doctors. The cost is enormous, and often spans decades. For some people, war and other traumatic events in their lives do not have an ending, but instead linger on as a never-ending nightmare of PTSD.